This is the cheerful view of my desk on a slighly cloudy July 4 morning. Perhaps a little bit of stitching before I head off to a fireworks party on the lake. The colored fabrics behind the stuffed kitty poppet are some dryer sheets I dyed yesterday. It's a good thing my family is not very tidy, as I scored a bunch of these used ones strewn about the laundry room. From their disorganization arises art. Hah! Great use of your boxes and I love the size of your kitties et al. I didn't realize how much detail you had on the fabric. It's BUCK - lol - learned that on So You Think You Can Dance - omg - I'm cracking myself up! 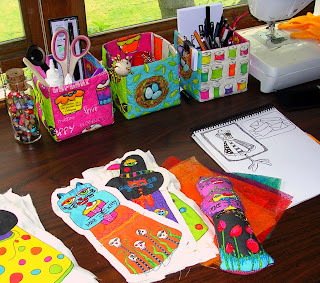 So have you totally reformed yourself or is this little peek at an oh-so-tidy workspace the sham I think it is?